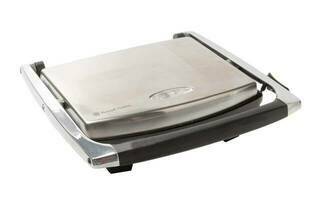 Snapshot: The Russell Hobbs RHSP801 sandwich press takes 1 minute and 58 seconds to heat up. How good is it at making a cheese and tomato toastie? Very large plate (can make four sandwiches at once). Just OK results in our toasting test. Plate height isn’t adjustable (so can’t make melts).